Lately, I’ve been getting more requests from customers for an additional skein to match a yarn that they purchased previously from me or from one of my retail vendors. This has happened to me too. I completely understand this dilemma; you buy one skein that you love with no intended purpose, later you decide what you want to knit only to find that you really needed 2 skeins! Then comes the mad search for another skein with the same dyelot and the worry that the skeins won’t match and your projected will be ruined forever! Up until now I have not been putting dyelots on my yarns. I generally dye in small batches of 5-10 skeins per colorway. However, as my business has grown I am doing more lots of 10 and some lots of 20 of my most popular colorways. I’m keeping more dyed yarns in stock, at the ready, to send out on a moments notice. This is all good! The dye techniques I use create variations between skeins even in the same pan, so the dye date is not a guarantee that the skeins are identical, just that they came out of the same batch. It has never been my goal to mass produce large numbers of identical skeins. I instead love the subtle nuances of each skein as it comes out of the dye bath. Overall, my colorways are consistent as I create my own color formulas and dye to the same formula each time I dye a new batch of yarn. I keep careful records of my process so that I can recreate the look of the original batch. Some of the yarns with multiple colors can have more variation between skeins as they depend on the movement of the dyes in the water to create tertiary tones. As always, if you know you will need more than one skein for a project ahead of time it is best to let me know when you order and I will do my best to send out similar skeins. Thank you to all my wonderful customers for helping me come to this decision. I love the feedback and I truly appreciate your business. 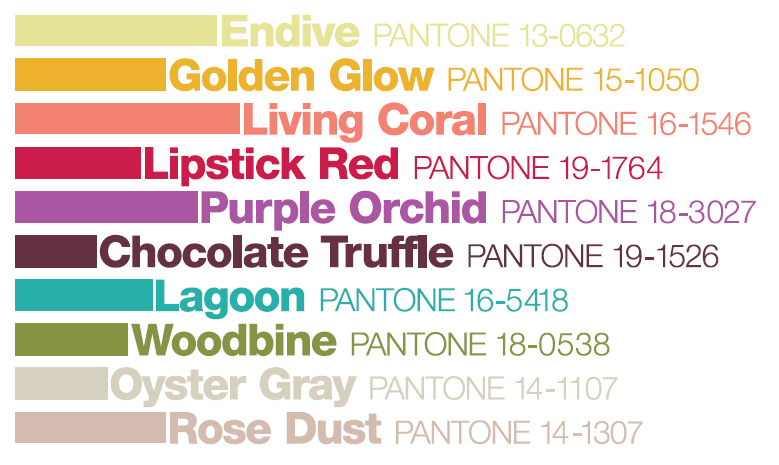 I find color forecasting so interesting. Sometimes I try to resist what the forecasters predict and purposefully seek out unpopular colors. But usually I succumb and actually want what “they” say I want! Here is what is forecast for Fall 2010 – just around the corner. I’m dyeing yarns today and I’ll use this as a springboard for some new colorways. I’ll have to put my own twist on them as the Rose and Gray is making me think of the 80’s. Are you craving these colors? 5/21/2010 Today I was notified by the retreat organizers that the retreat has been canceled. I don’t know anything more about the situation but if you had signed up, contact the organizers directly. 5/20/2010 The workshop has been put on hold while the company organizing it deals with some issues. I’m waiting to see what the outcome is before I move forward with more plans. I’m so excited to be teaching a 2 day dye workshop in Chicago, November 12-14. There is also a Ravelry group set up for the retreat with more information here Hand Dyeing Retreat. There will be plenty of hands on time, dyeing yarns with different techniques as well as time for knitting with hand dyed yarns. We’ll be exploring methods of developing colorways, sources for color inspiration, and how to get the knitted results that you want. Seems appropriate to start off the New Year thinking about yarns! I’m evaluating my yarns and planning ahead for 2010! It’s all about color. It’s how and why I got into dyeing yarns. It’s what inspires me. It’s the primary reason people seem to be drawn to a yarn. I’d like to offer more colors in fewer yarns. 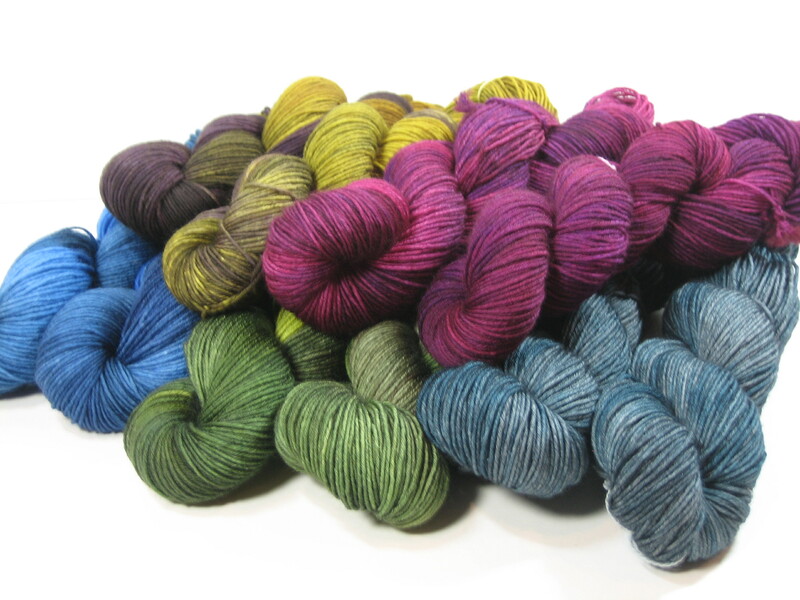 That’s good news – a couple of fabulous yarns in lots and lots of mix and match colors. I’ll still be sampling some new yarns but I’ll be concentrating on a couple of high quality, versatile yarns. My New Year’s resolution: Focus on high quality yarn in more colors to choose from. Sounds about right for 2010. I’m so excited to offer a new yarn. Its a multi-ply, 8 plies to be exact, tightly twisted, dense, springy, stretchy 100% superwash merino sport weight yarn! It comes in 65 gram skeins. Each skein has 214 yards, so you will need two skeins for a pair of socks. Its a wonderful weight and feels great knit up!. I also have a beautiful Peacock Rib sock pattern available free with the purchase of this yarn. The pattern was designed exclusively for Handwerks Sport Sock yarn by Jocelyn Blair. Treat yourself to an early Holiday gift!